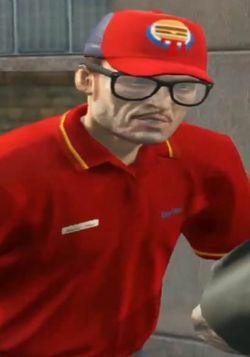 Ahron Ward is a character in the HD Universe who appears as a minor character in Grand Theft Auto V. His voice actor is not credited. Ahron Ward is, in 2013, a drug dealer and an employee of Burger Shot in Los Santos. He is friends with Jimmy De Santa, one of his clients, and sells him marijuana by the pound. Jimmy buys some pot off of Ahron and some mescaline hidden in a Burger Shot drink, which is used to drug Michael De Santa. Jimmy, having drugged his father, steals his fathers car and $2,000. Ahron later messages Jimmy on Lifeinvader asking about how 'that thing' with Michael had worked out. Got your message. Whatever you need, I'll be at burger shot. How did that thing work out with your dad? This page was last modified on 22 December 2014, at 20:22.